David Cooper's first piano lessons came at age seven, and for the next eight years he underwent the typical training of a novice pianist. After earning a Bachelor of Science degree in natural sciences & mathematics, he studied piano with Edith Schiff in Charleston. In the mid-Ohio valley he has performed in a variety of venues. 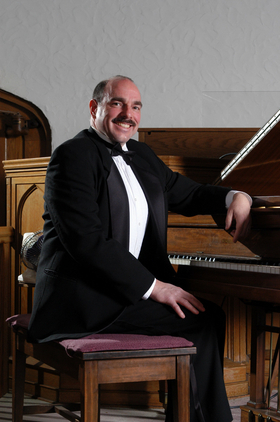 He plays both harpsichord and piano as soloist, accompanist, and chamber musician, and he was a regular performer in the St. Paul's Concert series in the 1980's. A founding member of the Trillium Piano Trio, he has played at The Castle in Marietta, Ohio in the Spectrum Music series since its inception in 1998. As a member of the Trillium Piano Trio he has performed in the Kanawha Forum Series, Sundays at Two in Tamarack, Glenville University, Saint Cecilia�s Concert Series, Lyceum Series, and the Arts Link Series. He is an Artsbridge Catalog Artist, a member of Arts in Education in Charleston, a high school biology teacher with a Master of Science in environmental & plant biology.